Sinn Fein County Councilor Martin Kenny has said that Ireland could do with learning some lessons from Norway as to how a Nation should explore and exploit its natural resources. Cllr Kenny was reacting to the news that the Norwegian Government has now become one of the biggest shareholders in Irish pharmaceutical company Elan. A new Irish documentary The Pipe has won more festival accolades, just days ahead of its nationwide release date. Director Risteard O Domhnaill and Producer Rachel Lysaght travelled to Amsterdam for the prestigious International Documentary Film Festival (IDFA) where they picked up an Honourable Mention from the IDFA Green Screen Jury before heading straight off to the Foyle Film Festival in Derry where the film received the Best Documentary prize. THE PIPE, the award-winning Irish documentary on Rossport’s struggle against the economic might of Shell, will be screened in The Eye cinema in Wellpark on Saturday December 4. The Pipe, which received standing ovations at the London, Toronto, and Cork film festivals, and the Best Documentary award at the Galway Film Fleadh, was directed by Risteard Ó Domhnaill and produced by Rachel Lysaght. The head of Ireland's energy department, John Mullins, warned in September that Irish people were being forced to decide between paying their mortgages or their heating bills. He lamented having to shut off gas connections all across the country in the middle of winter, but expected to do so anyway. 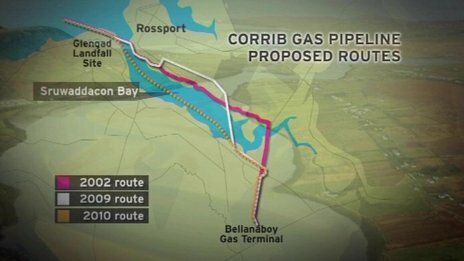 Beidh scannán faoin gcoimhlint idir muintir Ros Dumhach i Maigh Eo agus an ollchomhlacht Shell, The Pipe, le feiceáil sna pictiúrlanna ó 3 Nollaig. Here are some of the submissions that were submitted to Bord Pleanala in the oral hearing that ran from the 24th of August to the 1st of October. After the last twelve months or so, finding an Irishman with any degree of faith in his government is an almost impossible task but at heart most of us still have some belief that if we have right on our side, we will be protected by those sworn to do so. Risteard Ó Domhnaill’s documentary lays this theory to waste as he follows the ‘Shell to Sea’ campaign and the ordinary Irish people whose democratic rights were trampled by the relentless march of progress.